It's not all that often any more that I pick up a Scandinavian crime novel by an unknown-to-me author, and it's certainly way out of character for me to read a book that is seventh in a series without having devoured the other books beforehand. I'm actually quite OCD about series order, but I thought I'd take a chance with this book after being offered a chance to read it by the publisher (thank you!!) and so not knowing what I was about to get myself into, I spent most of yesterday reading this book. The first thing I did after finishing it was to pick up a Kindle edition of the author's first book in the series, Lethal Investments, because of what happens at the end of Faithless. While I obviously can't say exactly what that might be, I felt this need to go back and see why the author would choose to end things in the way he did here, and I figured that it must have something to do with all of the things I'd missed by not reading the previous novels. The first three books have been translated, as has book #5, so I have a bit of catching up to do. What drew me into this story wasn't so much the actual crimes and crime solving here (although I have to admit that I do like when the cops figure things out before I do) but rather the dilemmas faced by a couple of the main characters that play a huge role in how this story plays out. While there are a few different crimes under investigation here, the biggest one opens the novel with the arrest of a woman, Veronika Undset, whom the police have under surveillance because of her connections to a known criminal they are watching -- a "teflon" crook, meaning that nothing has ever stuck with this guy, so he's able to continue his operations. While searching Undset's bag, Detective Frankie Frolich finds a quantity of heroin hidden in her lighter, but she is eventually released. It's not long afterwards that Frankie is invited to the birthday party of an old friend he has not seen for years and gets the surprise of his life not only when he sees Veronika there, but when the friend introduces her as his fiancée. He gets an even bigger shock when later Veronika turns up dead. Because of his past history with her fiancé, he tries to get himself taken off of the case but is refused, and while he knows that no good is going to come of his involvement, he has no choice but to stay involved. What comes shining through in this book, and very nicely so, is the old cliché that the world is a very small place, and that it really is impossible to escape one's own history. It can be buried, maybe, but it's always there, and it definitely has an influence on the present. While this idea is reflected in several characters in this novel, it is best exemplified in Frank's role in the murder investigation. While he tries to remain professional, he comes to realize that the past is not really past -- and the choices he makes throughout the case may not exactly be limited to his role as a police officer. And while his own demons certainly play a role in the police investigation, he is also portrayed as being very human as he tries to keep them under control. The same is true of his colleague Lena, whose own circumstances lead her to make some very bad decisions. 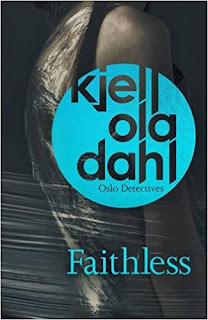 There's much, much more, of course -- the disappearance of a young woman recently arrived in Norway, a horrendous, unsolved murder from the past -- but for me it's all about the people and the author does it right. Faithless moves toward the dark end of the crime fiction spectrum in a hurry, as we watch how people deal with not only their own inner anxieties but also how forces that just may be out of the reach of human control have to the potential to play a role in unleashing the darker aspects of human nature. I have to hand it to this author -- I have had enough of thriller-type crime novels to last me a lifetime, but in this book, he has put his writing energy into getting into his characters' heads, which is very much appreciated on my end. I like Scandinavian mysteries, and this one sounds dark. It is true, however, that we have very little control over things that occur in life; I think we see this now in weather patterns and general discontent. No to thriller-type books. But yes to character development. I wonder if it's too "dark" for me. In general, I like Nordic noir, but not the most brutal or depressing.